House sales have been posting double-digit figures for the past three years, there is strong growth in construction and prices are clearly on the up. What will the future bring? As explained in the next report from Caixabank Research, this positive trend is expected to continue in the sector, both because of the Spanish economy’s good performance and also the healthy state of the industry itself. 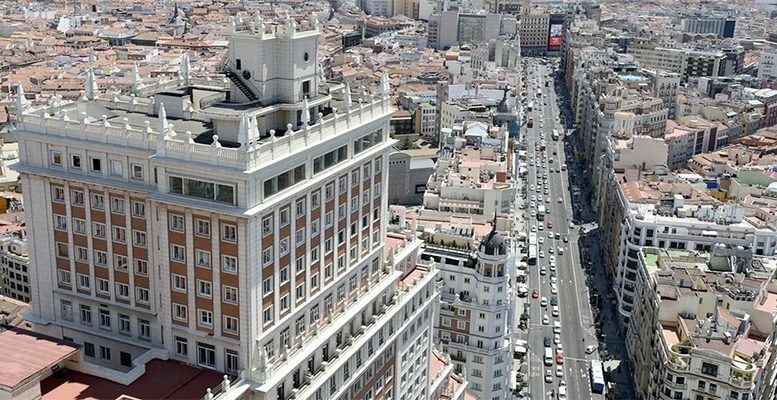 The real estate sector is crucial for Spain’s economy, both from a macroeconomic perspective and because of its large contribution to GDP and also in economic terms for families, as the home tends to be the main asset owned by households. This is particularly important in Spain as it is one of the European countries with the largest share of home owners (77% compared with 66% in the euro area), although the recent economic crisis has made it much more difficult for young people to buy their own home. The real estate sector is still of vital importance for the economy as a whole. Although its capacity has adjusted sharply over the past decade, the construction industry still accounts for 5.8% of GDP and employs 6.2% of all workers. It is therefore crucial to keep a close eye on the trends in the real estate market and its future prospects. After a long period of severe contraction, Spain’s real estate sector started to recover in 2014 and it is now clearly in an expansionary phase. The data speak for themselves: from the minimum values posted in 2014, annual house sales have risen by 13% on average, new building permits have tripled and house prices have increased by 24%. What factors lie behind this strong recovery in the real estate market over the past few years? Will they continue to have a positive effect in the future? Let’s begin by looking at the demand indicators. The most recent data show that house sales are clearly back to normal levels, breaking through the threshold of 500,000 units sold in August 2018 (cumulative data over 12 months). This gradual normalisation in the growth rate can therefore be interpreted as a positive sign: sales have risen by 11.0% this year up to September, slightly below 2017’s figure of 15.4%. The data provided by Google Trends regarding searches for housing on the internet suggest this upward trend will continue: searches are still numerous although, as can be seen in the chart below, the intention to buy housing has moderated off slightly in the past few months. 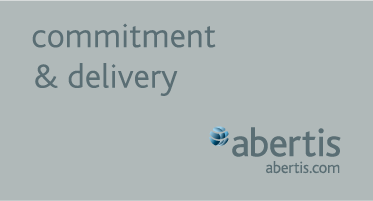 The demand for housing will continue to be supported by better employment conditions. Consequently, although the job creation rate is expected to slow down (from 2.5% in 2018 to 2.1% in 2019), gross disposable household income could still increase by around 4% annually thanks to wage improvements which are already starting to appear. The bulk of the evidence available also suggests that financial conditions will continue highly accommodative as the European Central Bank (ECB) will only normalise its monetary policy very gradually. This point is particularly important as there have been warnings of a shift in ECB policy and its potential impact on the real estate sector. 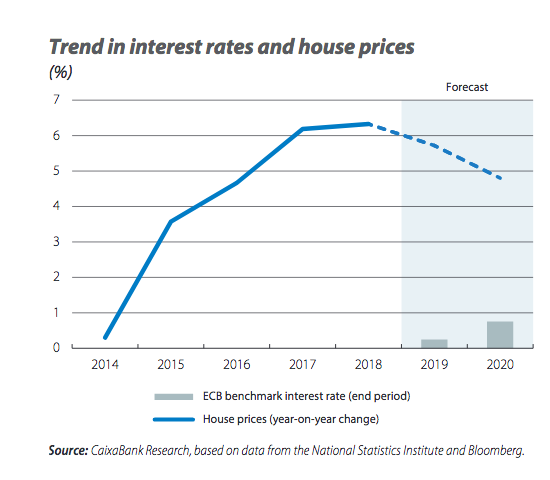 However, CaixaBank Research forecasts suggest the ECB benchmark interest rate will remain below 1% for the next two years. In any case, we should remember that the ECB’s decision to normalise monetary policy results from the considerable improvement in the euro area’s economic situation compared with when these exceptional measures were first adopted. 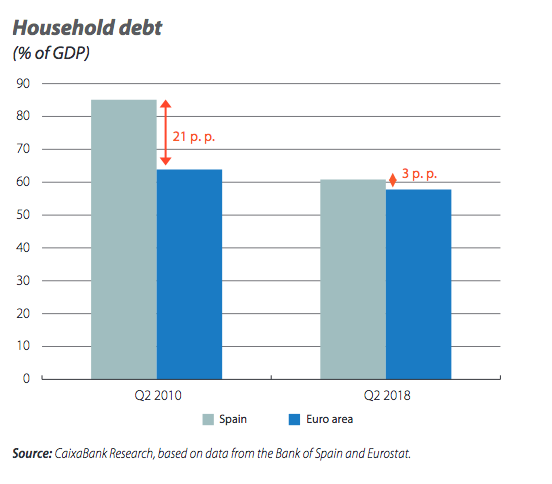 In particular, Spanish households are now in a much healthier financial situation after the extensive deleveraging carried out in the past few years: household debt has fallen from 85.1% of GDP in Q2 2010 to 60.8% in Q2 2018, very close to the euro area average (57.8% of GDP). Moreover, this household deleveraging has occurred at the same time as strong growth in the flow of bank credit to purchase housing: the number of mortgages grew by 8.5% year-on-year in September 2018 and the volume of new loans to purchase housing rose by 17.4%, cumulative for the year up to October. On the other hand, the growing trend for fixed rate mortgages observed in the past few quarters will act as «insurance» against rising interest rates. Another demand factor becoming particularly relevant in the recent recovery phase has been housing demand by foreign buyers. 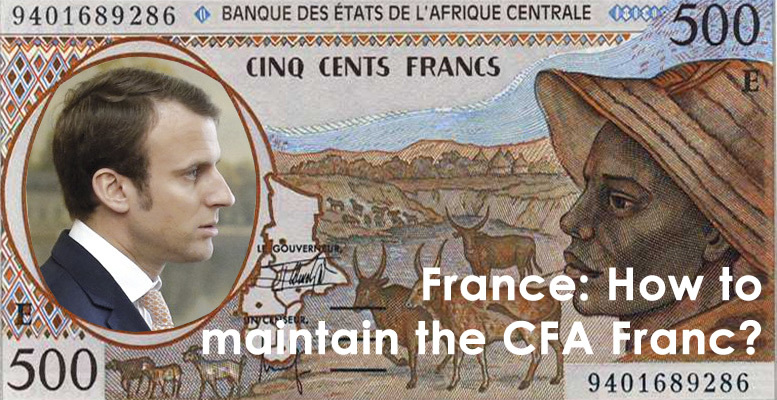 Foreigners were responsible for 17% of all purchases made between 2014 and 2017. This factor could ease slightly over the coming quarters due to the slowdown in the tourism sector, particularly arrivals by European tourists (British and Germans), who tend to be the most typical buyers of holiday homes in Spain. However, from an international investor’s point of view, Spain’s real estate sector is still highly attractive, especially because of the solid final demand in many zones. Supply indicators, on the other hand, all point in the same direction: in real terms, investment in residential construction grew by 6.5% year-on-year in Q3 2018; the number of registered workers affiliated to Social Security in construction increased by 6.1% year-on-year in November (much higher than the 2.9% for the economy as a whole), and confidence in the sector has improved considerably. Specifically, the European Commission’s confidence index for the construction sector was positive in September 2018 for the first time in over 10 years (we have to go back to October 2007 to find a positive value for this indicator). In spite of such high growth rates in the sector’s different activity indicators, the recovery does not seem to be excessive. 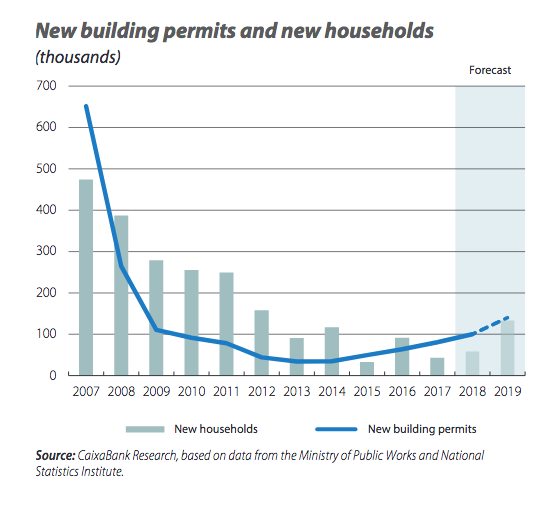 Consequently, although the number of new building permits has tripled over the past four years, the current level (95,000 permits in the 12 months up to September 2018) represents only one-seventh of the average number of permits granted between 2000 and 2006 (640,000). Moreover, the current volume of new properties being built is far below the supply that tends to be considered as absorbed annually due to structural factors. Specifically, Spain’s National Statistics Institute (INE) estimates the net household creation at around 135,000 units every year on average in the period 2019-2025.7We can therefore conclude that the supply of housing still has a long way to go and we expect its growth to continue over the coming years. In fact, liquidity indicators for the real estate market, such as the time taken for housing to be sold, show that the number of months required to sell a property has decreased, suggesting supply still needs to grow, especially in those zones with little new housing available, in order to meet the growing demand and thereby curb any excessive growth in prices during the sector’s current expansionary phase. As a result of the combination of strong demand and a supply which, although dynamic, is still relatively low, house prices are clearly rising. Specifically, the house prices published by Spain’s National Statistics Institute, based on sales, increased by 6.8% year-on-year in Q2 2018. This growth in house prices looks like continuing in 2019, albeit more moderately due to the slight slowdown in demand and expected increase in the number of housing completions which will come onto the market. Since gross disposable household income is also still increasing, this will cushion the impact of higher prices on house affordability. In the next article in this Sector Report, «How affordable is housing in Spain? Big data analytics», we analyse in detail the recent trends and outlook for the mortgage burden and housing affordability.Lastly, it is also important to note one key aspect of the current recovery in Spain’s real estate market: namely the fact that this is highly heterogeneous in geographical terms. Large cities such as Madrid and Barcelona and tourist destinations around the Mediterranean and on the islands were the first regions to recover. The real estate sector in these locations is now in a more mature phase of the cycle and, in some cases, a marked slowdown can even be observed in the growth rate of house purchases and prices. However, there are a growing number of cities and regions where a recovery is visible, especially in terms of demand, such as Seville, Malaga and Valencia. Nevertheless, construction is still relatively sluggish in some areas.